To reduce your cost, Brandsport offers this item in Bulk (sold here individually). Gorilla also lists this same item in 24-piece # 21134HT kit. Uniform nuts are a big plus with Gorilla Chrome Small Diameter Tuner lug nuts. Gorilla Chrome Small Diameter Tuner lug nuts are engineered with precision in mind. Keep your wheels turning true with a set of Gorilla Chrome Small Diameter Tuner lug nuts. 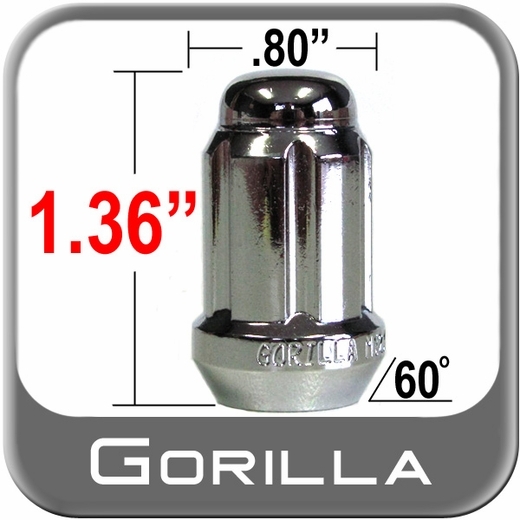 Help your wheels look sharper with Gorilla Chrome Small Diameter Tuner lug nuts. Glad I could purchase one instead of an entire set. Matches the others perfectly! Why buy a whole new set when you only need one? The only problem with this is that it's shiny and new, when the rest are dull and rusty. Otherwise very happy that I didn't have to replace ALL of my lugnuts, or buy something else that doesn't match. Thanks! Shipped quick & nice not having to buy a whole set when only needing a few.